Orange Peel and DOI measurement on high to semi gloss surfaces. Wave-Scan Dual and Wave-Scan II – a diagnostic tool for trouble shooting and optimizing appearance Now, you can establish appearance specifications for each paint layer to ensure the final appearance is always on target. Appearance control is no longer limited to final topcoat inspection. Like the wave-scan DOI, the optical profile of high gloss surfaces is detected using a laser light source. 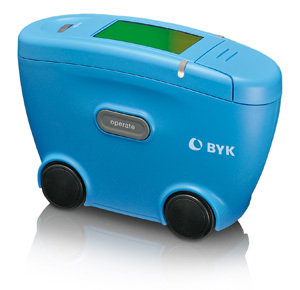 The instrument is operated with a rechargeable battery pack (Li-Ion). The docking station automatically charges the battery pack and transfers the measured data to the PC. Optionally, the instrument can be operated with 3 standard mignon alkaline or rechargeable batteries - good for 1000 readings. 5.9 x 4.3 x 2.2 in. An additional, infrared - high energy LED allows measuring the same structure spectrum (0.1 - 30 mm) on medium gloss surfaces. The dullness measurement is recorded with state-of-the-art CCD camera technology. It gives information on the image forming qualities of the surface caused by structures < 0.1mm. Close the appearance control loop for the entire paint process. Thus, the surface quality after each paint process step can be objectively evaluated. No more guessing which substrate layer is influencing the final appearance. The wave-scan dual will help you to objectively analyze appearance problems and reduce the time necessary for trouble shooting. Wave-Scan Dual – a diagnostic tool for trouble shooting and optimizing appearance. Now, you can establish appearance specifications for each paint layer to ensure the final appearance is always on target. 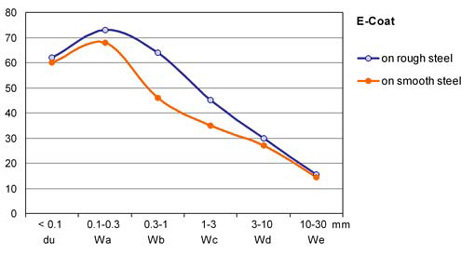 Same E-coat system was applied on rough and smooth steel. 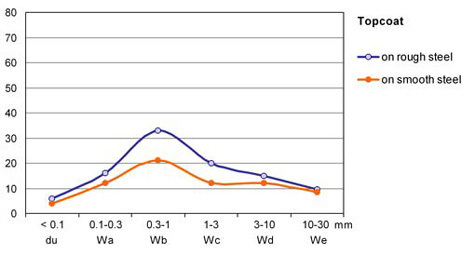 The influence of rougher steel can be seen in increased Wb and Wc-values. The primer surfacer was applied on both panels. 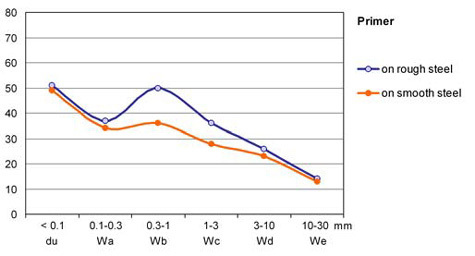 The roughness of the steel quality can still be detected in increased Wb and Wc- values. This primer system could not completely cover the steel influence. The final appearance shows higher shortwave values on the rougher steel panel. Therefore, the smooth panel will appear more brilliant.